If you are a mom and you are looking for ways to have better days, to get more done, to get everything off on the right foot, then you’ve probably read a blog post (or twelve or 100) on how you have to get up before your kids. How the only way to get your day right is to set an alarm, get up, shower, work out, and have quiet time with a cup of coffee, all by yourself before your glorious little cherubs feet come pitter-pattering down the hall to announce their awakening and their welcoming to the new day. Click here to sign up for 10 days of praying through 1 Corinthians 13 for your marriage – delivered right to your inbox each morning. I know, I’ve read them all. I’ve read all the ways I should enhance my mornings and be a better mom. But you know what? I don’t get up before my kids. And I haven’t since I stopped working full time out of the house. Every time I read one of these articles, I have some mommy-guilt on all of the things my children are missing out on by their mother sleeping rather soundly until I hear their little voices come through the monitor in the morning. And after talking with some other mommy friends who also have had some mommy-guilt over not getting up before their kids like we “should”, I thought to myself: there are a LOT of benefits to sleeping till the kids get up in the morning. 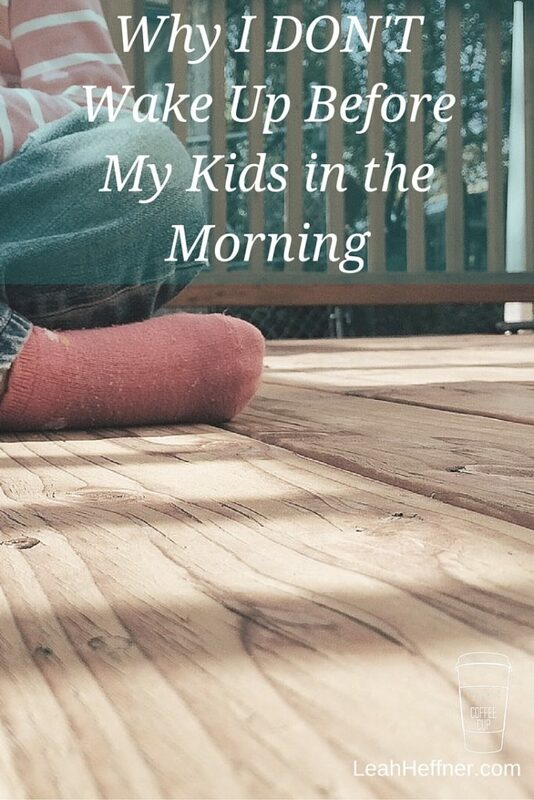 How did getting up before our kids in the morning become the “should”? Am I a better mom because I get up earlier and a worse mom if I get up later? Is that the scale we’re measuring against? After thinking about this I realized: A lower number on my alarm clock each morning does not equal a higher number on my mommy report card each night. Some kids do not wake up at a consistent time each day. My kid would fall into this category. So to guarantee that I beat him up every single day and then giving myself an hour or more on my own would mean that I’m getting up around 5 am. That’s a potential 2-2.5 hours of sleep I’d be missing out on the good days. If I got up before my kids, I would be spending the morning literally walking on egg shells so as not to wake up the kids who kick in to light sleeping mode somewhere around 3am. And I’m clumsy. So being quiet is not exactly my forte. My daughter can open the doors herself and this means that in the morning, when my son wakes up, he waits for his sister then they run right into my room. And bring their blankies. And crawl into bed with us. And we have toddler snuggles. We’re all in bed together. And we get to wake up slowly and laughing and being together. And snuggling. When we all get up together, there is a hierarchy of needs that are met. Diapers first. Coffee. Then breakfast orders. Then breakfast making. Then lunch packing. Then coffee drinking and breakfast eating. Sippy cups fall in there at some point, I mean obviously. What does this have to do with patience? There’s nothing waiting on the table. I’m not on the ball. We have to ask politely. Wait our turn. Help mommy with breakfast. See, patience. At breakfast we all sit together and read a kids’ devotional book. And then I turn on music while I do dishes. And then we set up in the toy room and I grab my stuff for quiet time. And my kids SEE me doing quiet time. I can talk to them about what I’m doing. They can help me. OR, and this is a big or, sometimes (shh don’t tell anyone) sometimes the devotion I do with the kids is my quiet time. And I know, I know, it’s not how to properly do a quiet time. But that’s something I’m just learning to deal with. Because instead of getting caught up on what a “proper quiet time should be” I’m rejoicing and celebrating that I am getting to model for my kids to spend time in God’s word. That we’re learning truth from the Bible together. And that I’m getting to do this thing I call Intentional Simplicity. When breakfast is over, we unload and load the dishwasher. We wash dishes. We clean up the kitchen. WE, together. I know it takes longer with two toddlers. I know my silverware drawer looks like there is no divider being used. There is a reason I bought bins for all of my plastic instead of trying to find cupboard space for it. But I’m teaching them to be involved in chores. So I don’t get up and work out before my kids get up. I don’t drink a magic smoothie all by myself. But instead I make green smoothies for all of us. My kids do push ups with their dad. Or they stretch with me. But they see us take these healthy steps. And if some day I take a class or do a fitness thing, they’ll be going with me with my little entourage. After the kids go to bed, I get caught up on my WAHM stuff. I get to talk to my husband about stuff that I do for his business. I get a solid consistent time of working or writing. My husband and I *gasp* spend time together. I take a shower. And sometimes that means I stay up later than I should. Honestly I can’t burn the candle at both ends like I used to when I was like 20. So I choose to sleep in the morning. Right now I am in a season of life where I’ve been married for 5 years and I’m pregnant for the third time. With nursing and pregnancy, I’m tired. I’m getting woke up several times a night. I’ve never thought it wise to cut myself short on sleep in this season of life. I love love love learning and growing and changing. And if I felt convicted that I needed to be up before my kids, I would try it. But I don’t. And I think that we need to extend more grace to each other in this. I don’t think that getting up before your kids is the only “right” way to do a morning. I don’t think women should feel like that’s the ONLY way to get “proper” quiet time. And the only way us to share in this together is by extending grace. To acknowledge that different things work differently for different people. And that we can do things differently – especially when it comes to sleep. I actually don’t think getting up before the kids is bad at all. My argument here is that it’s not necessary to have consistently good days with them. This definitely works for me in the season of life I am in right now. When I am in a different season of life, this may have to change. But I am ditching the mommy guilt over my wake up time and I invite you to do the same. How does this go at your house, friends? Are you up and at’em before the rest? Or do you enjoy a baby alarm clock? P.S. I wrote a follow-up post on cultivating Mommy-Grace in a Mommy-Guilt world. I invite you to check it out here. I have a 14yo and an 8yo. I sleep as long as they let me. They get up at 5am and I’m sorry but if I want to get up before them I would seriously have to get up at 4am. Not going to happen. They know their lives will be much happier if I sleep. Leona, you don’t have to be sorry. I think it’s great for some people to get up before their kids and some people not. Thanks for sharing! I feel that mommy guilt all the time about not getting up before kids! But like you I find it almost impossible to get up before the kids. And I love your 10 reasons why not getting up early is good….no one has ever said it quite like this before. It releases a lot of that guilt and allows me to cherish the sweet times I enjoy in the mornings with my kids! No guilt here! My hope was to encourage moms who do it another way. I bet you get some precious times in the morning! YES! I totally could have included things for the non-morning person people. I used to not be a morning person but now I am. I’m happy and cheerful and ready for my kids to jump on me in my bed. But I just enjoy the snuggle time and the antics so much. Also. YES. Relationships > Productivity. My emotional and mental capacity is higher because I sleep till my kids get up. That means relationships that need a lot of those capacities can do better. If you write something similar, send it my way. I’d love to see it! Great Post! I decided to try the ‘wake up early’ thing…I’m on day 2 of waking up before the kids. Today, they woke up 30 minutes earlier than usual…and each time I try this, they seem to know my plan, so they start waking up earlier and earlier…I like your reasoning! This is what happened to me. I enjoyed my “waking up before the children” on the days they slept but it became apparent that I could expect them to randomly wake up at different times. Right now I’m on a Holy Spirit alarm. When I wake up early, I try to go ahead and get out of bed and pray for the Lord to guide my day. Sometimes that means 5 minutes before the children wake up, sometimes that means 15. Some days I get blessed with an hour or more and some days I just snuggle back down for some extra rest. The Lord is good and I am so thankful for Mom blogs that have helped me release Mommy guilt and the idea that there is some mold I have to fit in to. God HAS created us uniquely different and the best that I can do on my journey of Motherhood is to “Be still and know that HE is God.” Thanks for sharing, Leah! I am with you on staying in bed until I hear the kids get up, even with homeschooling. I am a night owl and I get more done at night than any morning. My kids can smell me and they are up. Be a mom with zero guilt! If it works for you then do it. Don’t let the thoughts of what other do or don’t do steal your joy of mommiehood. I miss the days when my toddler would sneak into my room and sleep with us. he would always hold my hand as he slept. You are making some great memories. enjoy them! I don’t get up earlier than my daughter unless it is a MUST and that only goes for days we have to take my husband and drop him off at the unit which is once or twice a year. The earliest my daughter has ever gotten up is 8:30 until I learned that if I bring her into my room before the sunrise she sleeps til about 10! So now when my husband leaves for work at 530 he brings our daughter into our room and we sleep til 10. I hate to say it but starting school in the fall isn’t going to be fun! We aren’t morning people, lol. But I have to strongest bond with my daughter that I have ever seen. If we’re not sleeping all night together then we at least have the early morning of sleeping and we always cuddle to wake up. We both wake up in better moods and have better days because of our slow mornings. Yes, I might get more done if I got up earlier but I’d rather stay up a little later to finish than wake up early. She’s 5 and the only time in her life I woke up earlier than her is when I refused to be away from the hospital any longer than I have to. I was up and out of the house by 6 and not back until 9 every night. A long 3 weeks but worth every moment. My youngest is 27… Years, not months. I cannot even remember whether I got up before them when they were toddlers. They used to wake in the middle of the night and come into our room where we had a little sheepskin rug where they’d sleep there half the night. We all slept better for them having a “safe” place to come & sleep if they woke up frightened. Then they’d crawl into bed with me after daddy got up. On weekends if he slept in we’d all be snuggling together in the queen size bed. Ladies, get a king size bed if you have toddler snugglers. 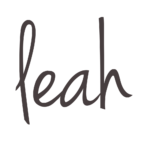 Leah, I love that you’ve embraced what worked for you. As long as your kids are healthy and happy, ditch the guilt. 20 years down the road all that matters is if they love the Lord and serve Him and are happy & healthy. Who cares if you get up first or not?! As a woman well past child bearing years and now a Nana, here’s what I have to say about your post. Amen, Amen and Amen. I was never good at getting up before my kids. And when I did they ALWAYS got up shortly after I did which defeated the point. From what I can see here you are a great mom. We don’t all have to do it the same way. That is not how God created us. Great post! Snuggle time is the best. I am NOT giving that up!!! Love your post. i dont have kids yet, and so i just stumbled on your post through a friends facebook, but it caught my eye. so since i dont really the mom blogs much, i didnt realize it was a thing to have to feel guilty to get up before your kids. some of my favorite memories of my mom growing up are crawling into bed with her in the morning (which obviously meant she was still in bed at that time!) they really really are some my happiest memories and it would seem so sad that she would have given them up just to be more productive! Love it! Finally a post that fits our life too! I have a feeling mine will change over time. Thanks for the great encouragement! Great stuff! You verbalized so much that I’ve felt but couldn’t say right. The best mom in my opinion is one who doesn’t lose who SHE is and still makes her kids a top priority. I have found looking back on much (my kids are 17 and 14) that the decisions I made where I did what I wanted to do (like sleep late) were the best for me AND my kids. Teaching them that getting up and breakfast isn’t made yet is important. They need to know life isn’t magically prepared for them. Doing things together was so much better for us. They learned how to take care of themselves and to respect others. They learned that they can help and their contributions are valued. They learned that they need to help others just as others help them. The reasoning that it takes longer when kids help always seemed like an excuse to me. An excuse to control outcomes, time, and messes. Let me tell you, it takes a lot less time to make dinner now when one kid actually does the shopping and another does the dishes. That wouldn’t have been possible now if they hadn’t made messes but tried when they were little. It also validates their opinions and choices. This all has to be explored before anyone is good at it. But the snuggling, that’s the best in the world. No hurries, no worries. Fun and giggles. Sometimes even teens need this time. It’s a safe zone. It felt to me like I was letting my kids are who I was and what I liked ( night owl and sleeping in….or I cook if you do dishes) let them explore their own preferences. Wow. The best articles are the ones that make you think and reflect. Thanks for giving me the words to define what I felt and let me see the benefits of what I chose. You made me cry. Oh this speakers to me!! Thank you for putting into words what I’ve been thinking!! I am so glad that I found your blog. Just today I asked myself yet again if I should get up earlier so I can be the “mom in charge” and wake up my 2 yr old daughter instead of her waking up next to me and taking blanket away and saying aufstehn (German for get up). So I am very very happy to see that other moms go through the same guilt trip and finally I feel like it is totally ok how we do things. I just don’t know how we will do it when my hubby is back (deployed). In order to have breakfast together we would need to shift times by like 1 to 2 hrs. Ah well, snuggling with lil one is so so so worth not getting up before her! And she sleeps longer next to me as well. So thank you for sharing your experiences here! Thank you so much for sharing this point of view! Because I was hearing so much of the other story, getting up early. And I see the benefit in that. But I haven’t heard this side of the story. And it’s so needed! My husband is away all day at work and doesn’t come in till late. And he not only wants to spend time with me but also his kids. So we all get to bed a little later. Once the kids are in bed, then I still stay up with him for another hour or more. And it’s late, sometimes around 12am! So to hear your story about not feeling guilty about sleeping in really gives me more peace of mind. That there is another way to fuction throughout the morning, and day even if I do wake up when my kids do. Thank you! I have been homeschooling for 14 years, have tried it all as far as sleep patterns. What the Lord has me doing now is getting up at 6 AM to spend time with Him, then going back to sleep with the baby (who I nurse in bed and LOVE it!). Sometimes getting up at 10:00. I have five beautiful children and they are turning out more than great! We are a military Family and I was getting up so early that I took a long nap during the day which made me uncomfortable because I was then neglecting the kiddos. Now it’s better because I stay up with them all day and I’m actually more productive. Someday I may get up early but now is not the season. Thanks for the encouragement. I too see both sides. Right now in my season of life, I couldn’t beat anyone awake if I tried. I know lots of other moms in this position. Maybe some day I’ll change. We’ll see. We’re always growing and changing, huh? I love this post! It is so true. I’ve always thought it would be ideal to wake up early, but the fact is, it’s not always feasible- like when we’re up late for various reasons, illnesses, or seasons of pregnancy, postpartum etc. 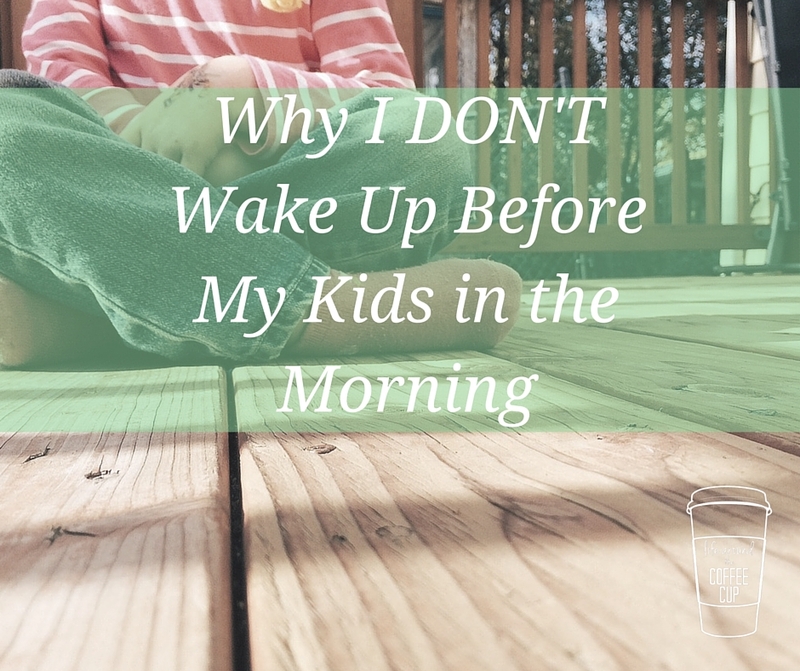 I’ve always wanted to wake up earlier than my kids not because I felt I had to measure up to some popular mom standard and fit in with the crowd, but because I generally felt it would benefit my family and myself. And though this is my goal, I’ve had to learn to not feel like a personal failure when many times, it does not happen. Sure I’d like to have things done and ordered before my kids wake up, things could definitely run more smoothly, but it does not mean I cannot have an enjoyable day with my precious littles in the midst of a chaotic and unplanned morning! You have many good points. And I especially like how you mentioned they are learning about devotional time with God and helping out around the house when you do it together. Thanks for your encouragement. You’re right – there are pros to getting up earlier than your kids. In this season where it’s just not really possible, I will see the good things about getting up with and to them every day. This is a wonderful post. I was just feeling guilty about not waking up early having my quiet time and having breakfast ready. But your post is my life. I would have to wake up extremely early and be quiet as a mouse to not wake up my boys (7,3) also I am a nursing mom so I am up a lot at night. Id rather wake up with them happy then be awake and grouchy. But that’s me I’m not a morning person. Natalie sleeping is ok. Being rested and having something to give out of is good. You’re doing great. Ha. Looking at all the replies you have to this entry.. obviously there are a lot of mums that can relate. I love your honesty and acceptance and gratitude for all that meets you in your day. Blessings to you! thank you for your posts. I have feared homeschooling because I haven’t “got it together” in the way I feel I should as an adult caring for little ones. I know when I was teaching I could be so present with children when I had that time to myself at the beginning of the day. But I had the blessing of that child-free phase to offer that. I was grateful, but never comprehended how hard that would be to achieve once my 2 joined us. No more guilt. thanks again! Thank you for this! I just finished reading one too many “wake up before your kids” posts & told my husband I was going to try to wake up earlier. Then I read yours & told him NEVERMIND! He was like ‘what happened?’ LOL I didn’t even realize I was carrying mom guilt over this (and other things, if I’m totally honest).